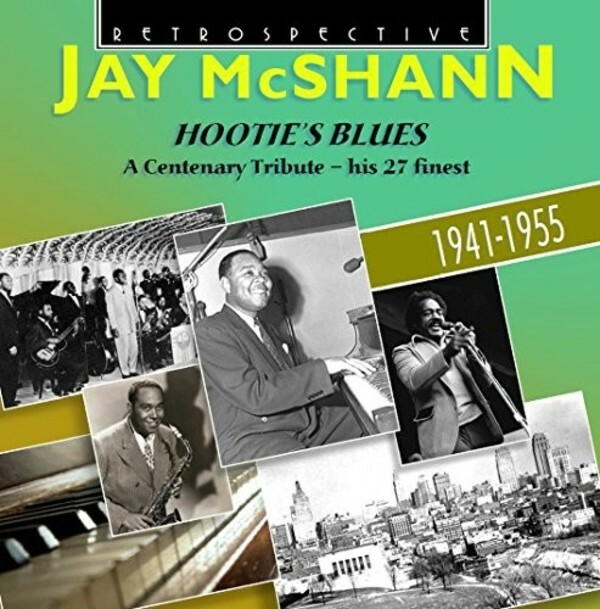 Retrospective pays a centenary tribute to Jay McShann with a superb programme covering every aspect of this great jazzman at his ebullient best. American jazz pianist and bandleader Jay McShann (1916-2006) enjoyed a long career during which he carried the flame of Kansas City jazz at its Count Basie-inspired finest, as well as being acknowledged as a truly great blues artist. During the early 40s his band was the training ground for such stars as Charlie Parker. ’Hootie’s Blues’ pays tribute to Jay McShann with a wide-ranging portrait of his career during the 40s to mid-50s. Most popular at the time were the swinging blues numbers sung by Walter Brown (Confessin’ the Blues, Hootie Blues, The Jumpin’ Blues), while jazz historians are most grateful for the early soundings of Charlie Parker (Swingmatism, Sepian Bounce). McShann’s own brilliant piano playing is featured on trio tracks Vine Street Boogie, Hold ‘em, Hootie etc. He it was who introduced the great blues shouter, Jimmy Witherspoon, heard here on some real classics (’Tain’t nobody’s business if I do, I wanna little girl). Come the 50s and McShann’s band was creating jazz milestones with Ben Webster (Reach and The Duke and the Brute) and, in 1955, even topping the R&B charts with Priscilla Bowman’s Hands Off. What a band and what a musician!